Just like a regular bike, Electric bike's need routine maintenance. An E-bike has a few more additional components like the motor and battery. The motor is pretty much maintenance free, but the battery requires regular charging. In my research, I have found a few different opinions about how you should care for your E-bike battery and how to charge an electric bike. Here are some E-bike Battery Care and Maintenance Tips. How to charge an electric bike and best practices. I will present in this post the various theories, claims and advice I have researched and presented them to you and let you ultimately decide how you will care for your E-bike lithium-ion battery. Lithium-ion batteries are not cheap and are generally one of the most expensive components on your E-bike. They often can cost over $500 to replace. Here are a few quick tips for electric bike lithium-ion battery care. Example regularly using 1 hour quick charging will decrease the overall lifetime of your battery. If you still want to quick charge at least get a quality programmable charger. This will decrease the capacity of the battery and reduce its overall lifetime. Batteries like to be used regularly and keep a charge. Keeping a battery dead for a long period of time makes the battery in simple term lazy. The internal battery regulator needs a slight charge to do its job and if the battery is totally dead the regulator will not work and the battery may not charge. Always keeping battery fully charged will reduce the batteries lifetime. Batteries like to be kept at a moderate temperature for maximum charge. Batteries below a certain temperature have a reduced battery power and the same is true when a battery get to hot. Avoid parking your E-bike in direct sunlight on hot days. If you can go back and forth to work on a single charge, do not charge your E-bike at work. Instead charge your bike when you get home when the battery has reduced to 10 to 20%. This will maximize the overall life of the battery. The battery is generally quite heavy and is housed in a plastic casing. Dropping a battery can seriously damage or ruin it. Be sure you bike does not fall over and if you have your battery in your backpack handle it with care. Not only is the battery the most expensive component on your electric bike, the battery is made to be conveniently removable. Unfortunately thieves know this as well so the best practice is to bring your battery with you and not leave it on your bike. E-bike battery do have locks but this does not slow down thieves. Unfortunately many Electric bike manufacturers use the same lock on all their batteries and the same key can unlock batteries on different bikes. A new key can be obtained very easily and you can bet thieves know this as well. A battery is a little like a muscle. The molecules will get lazy and will not recharge. A battery left totally dead for a long period of time will dramatically reduce the overall life and running time it may likely not charge at all. Many bike shops owners say people come in with dead batteries all the time because of poor storage practices. Avoid storing your battery at extreme temperatures. When charging your battery be sure you are in an open vented area at a moderate temperature. Overheating can cause the charger to overheat and possibly start a fire. Don't just leave your charge hooked up to the battery for long periods of time. Many chargers have auto shut off but if the charger remains connected the battery may naturally lose some charge, and the charger will kick in and charge the battery to 100%. 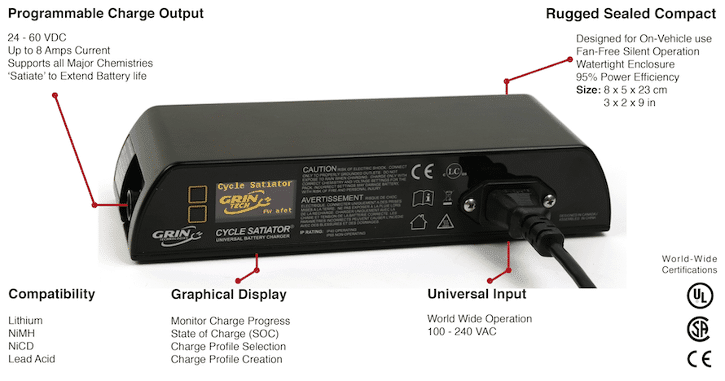 This continual charging will shorten the range of your bike. You will want to get the most out of your batteries lifespan because replacement batteries are not cheap regular usage ensures the best lifespan of your battery. How long do most batteries last? Many batteries will typically last around 3 or 4 years before you will start noticing a decrease in range. You will have to charge more often. You may begin to notice you run out of power on the way home from your round trip to work where you use to be able to make it all the way back. If it happens sooner, the reason for this may be caused by overcharging, over discharging or poor balance. All can affect the lifespan of a rechargeable battery. The Battery type is a significant factor in how long your battery will last. Lithium batteries are becoming the standard, and this type of battery gets 10000 charge cycles. Nickel batteries are not as popular and get around 500 charge cycles. Lead batteries are also not as common and get around 300 charge cycles. Most newer bikes do not use this type of battery because they are the heaviest option. When you plug in your battery beyond the recommended charge time. Like many of us we plug it in and go to bed, many batteries require only 4 to 6 hours to fully charge and are often plugged in for many more hours or even forgotten for days. This is not good for your battery, and this will gradually reduce its charge capacity, and the charge will last a little less time for each charge. Add to that that a battery only has a certain number of charges and this further reduces the overall battery life. It’s a good idea to have a timer on your charger and set it for the correct length of time. In simple terms, it is discharging a battery to the point that its voltage is below some critical level which can be damaging, or even dangerous. Do not let your battery discharge below the recommended cut off voltage. When you plug in a charger to a battery that is below cut off voltage the charger often will not see it and will not recharge the battery. So do not let your batteries totally discharge. Usually, the battery pack should have some sort of supervisory circuit that disconnects the cells from the charger or load when the cells are above or below the recommended voltages. These chargers are quite a bit more expensive than regular chargers. But if you have a few E-Bikes in your household, the extended lifespan of the battery will quickly recoup the cost of purchasing an expensive charger. As you can see by the chart a battery's life with 500 useful cycles can be reduced to half by overcharging but undercharging to only 80% can increase the battery's life up to three times. 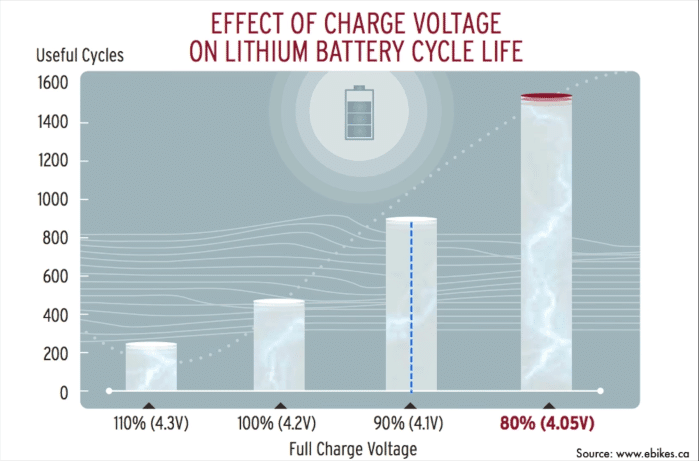 A new Lithium-ion battery often comes with around a 50-60% charge. This is the ideal percentage when storing a battery. When you first get your new battery you should give it a good charge to 100% to wake up the battery and ensure all the battery cells are balanced. Do this only the first time you charge the battery after that charge to 80% is ideal. ​A 100% charge once in a while will rebalance the cells if you find your battery not lasting as long as it should. Always charge your batteries before storing. But charging a battery to 100% will reduce the overall life of the cell. It is best to have it at about 50% charge or just under a full charge. If you cannot set the voltage level, then go for a little ride after fully charging batteries, and you should be good. If you are not riding for many months, check the battery every few months to make sure it has not drained entirely dead. If you find it going below 50% plugging it into a charger for a half an hour but don't fully charge it. So don't forget about your batteries over the winter. Basically, rechargeable batteries like to be used regularly and sitting dormant is not ideal. But due to seasonal riding, this can't be avoided. Give them a little love over the winter, and hopefully, they will last a little longer. See my complete post How to properly store your e-bike for winter. I have mentioned this a few times with Electric bikes, they like to be used. If you only plan to use your E-bike only a couple of times a year, I would suggest just getting a conventional bike. The cost of replacing a battery every few years is the same price as many good traditional bikes. A battery on an electric bike can often be one of the most expensive components on your E-bike so practicing a few precisions and using proper charging techniques will help ensure you get the decent life out of your battery. As you can see, there are a number of battery charging theories and to be honest at this point I am also a little confused. I do believe that letting your battery run dry and let it sit for an extended period of time is not good and storing a battery at around 50 percent charge is a good practice. This is practiced by battery companies when storing batteries so it must be valid. I also think continually overcharging a battery is no good and using a full charge cycle before charging is a good practice. A battery should last about 3 or 4 years if treated properly. I hope this article helps you get some extra life out of your battery. If you have any comments or feedback from your own experiences, please comment and share your experience. I am looking for people that presently own an E-Bike and would be willing to do an interview with me about their E-Bike. I would like to interview you on Skype and ask you a number of questions about your E-bike and personal experience. This should take about an hour or less. I would like to have a good time with you and have you share your thoughts on your bike. You can then send a few pictures of your E-bike and I will include them in a post on my blog. If anyone is interested please contact me and we can set up an interview date.